All of our cosmetic products are hypoallergenic, and non-comedogenic. We carry a large selection of mineral make-up, free of talcs and synthetic ingredients. We’ll make your eyes sparkle. Perfect for a big night out or celebration. False eyelashes if desired. Day look available. Airbrushing provides a flawless complexion without looking “made-up”. A gentle mist of color, matched to your skin tone, can last up to 12 hours or more. Perfect for weddings, big events, media appearances, head-shots, or simply a night out. 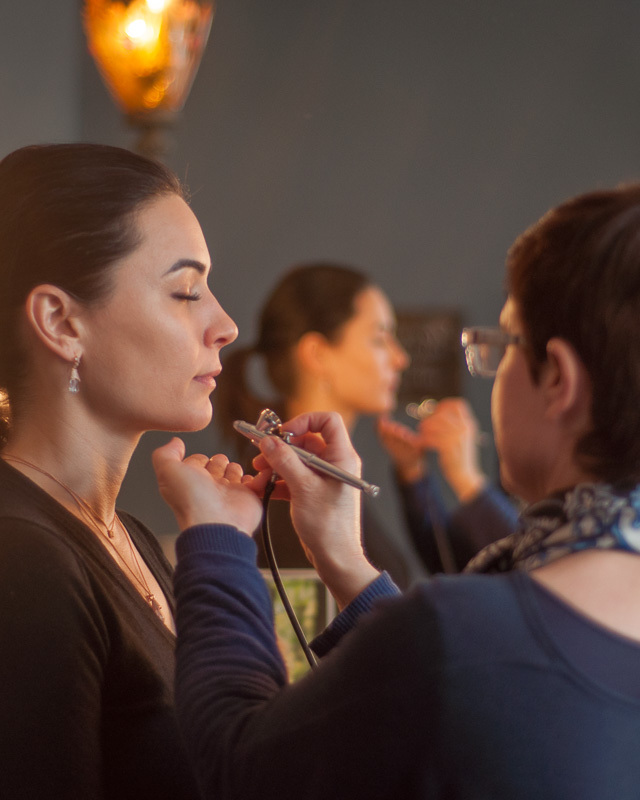 Let our makeup artists fashion a more beautiful you. In this 90-minute hands-on one-on-one lesson, our artists will teach proper application techniques personalized just for you. Bring your cosmetics and we will go through them together, eliminating unsuitable items. Plus your final routine will be written down so that you can reproduce it on your own. Before your big day, we will help you decide your perfect look as a bride and test it out with our professional makeup artists. On the day of your wedding, let our makeup experts enhance your beauty with our hypoallergenic cosmetics and airbrushing. Pamper yourself and we’ll come to you on your wedding day with our makeup kit. Two-hour minimum includes services for three people and includes airbrushing. Copyright © 2014–2019, Mireille's Studio. All Rights Reserved.